FLINT, Mich. (CNS) — Following the discovery of lead in the city of Flint’s drinking water, relief organizations have been working day and night to provide safe water to those living and working in the community. Standing at the front of the battle is Catholic Charities of Shiawassee and Genesee Counties in the Lansing Diocese. The agency that provides assistance to people in need, including counseling, substance abuse treatment, foster care and adoption services. Vicky Shultz, CEO of Catholic Charities, said the health and safety issues continue to be a “major crisis,” and the organization is distributing bottled water and gallons of water, as supplies allow, to families and individuals in need. Community members across the diocese are urged to provide aid in the form of donating cases or gallons of water, water filter kits and replacement filters, or monetary donations. “(Water) is a basic need we have as human beings,” said Schultz. “We’re already dealing with poverty (and) huge unemployment in the city of Flint, and now we have water that’s not suitable to drink. “The first population (affected) we know is babies. 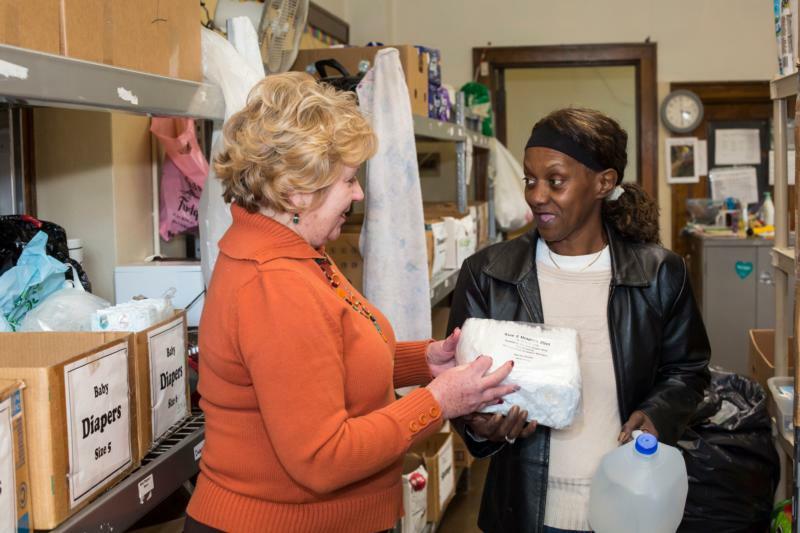 So when people come to our Community Closet asking for diapers … we’re making sure that everyone who leaves who has a child has the gallon jugs of water,” she said. According to the Detroit Free Press and other news accounts, the water from the river contains eight times more chloride than Detroit’s water and that the chemical, which is corrosive to metals, ate away at old lead-lined service pipes that connect to residents’ homes. It allowed lead to enter people’s water supply because officials put no controls in place to prevent that from happening. Last fall, Schultz said, Catholic Charities, which is in the heart of Flint, knew the city was facing problems because the water not only changed colors, but smelled foul. “We were being told … everything was safe,” she said, adding that because of what residents were told, they continued to use the contaminated water to make drinks and food, increasing their exposure to lead. Residents also were exposed to chemical byproducts, E. coli and Legionnaires’ disease in the water. In mid-October, Flint reconnected to the Detroit water supply. The three soup kitchens run by Catholic Charities of Shiawassee and Genesee Counties served more than 185,000 meals last year alone, according to Chrissy Cooper, the agency’s development specialist. “It’s something I don’t think anybody expected it to be as big as it is now,” Cooper said, referring to the water crisis. “Now, we’re trying to understand all the consequences, and I don’t think we have yet quite grasped everything that’s going to come out of this problem. “We want to make sure people who want to donate know how thankful we are and the people who need the water know how to get it,” she told FAITH magazine, a publication of the Lansing Diocese. When the lead scandal came to light, Catholic Charities switched to bottled water. Filters were then installed at its facilities. Schultz said it was “disheartening” to hear the news of the lead because Catholic Charities had been working with the city and the Salvation Army to help pay citizens’ expensive water bills. Prior to learning about the lead, the agency also was assuring hundreds of clients and employees that the water was safe. “I think we’re just very disappointed that somebody really didn’t figure this out. It took a doctor having to do a blood test,” she added. Michigan Gov. Rick Snyder declared a state of emergency for Genesee County Jan. 5, and on Jan. 12, Snyder activated the National Guard to assist with distributing supplies at established water resource sites in the city. According to Shultz, the number of phone calls from people wanting to help has increased, but so have the number of calls from concerned clients. “We’re all children of God, and we’re supposed to look out for one another,” she said. DeLamielleure-Scott writes for FAITH magazine, a publication of the Diocese of Lansing.